Early glassmaking centers tend to be located close to the Mediterranean coastline: early glassworking centers tended to develop in the suburbs of the Empire's main cities—Rome, Jerusalem, Alexandria, Athens, etc.—since their marketplaces were a natural outlet for every workshop's products. But there also were many smaller glassmaking sites operating close to military camps and provincial towns scattered along the coastlines of Italy, Spain, and the eastern Mediterranean provinces; and in various villages along the Nile, in Egypt, where natron was most readily available. In the lands of the Western Empire from the mid-1st century A.D. onwards, however, glassmaking workshops seem to have been organized quite differently from their Mediterranean counterparts. Remains of sizable furnaces at various places in the northwestern provinces suggest that bulk stocks of glass were being produced, but most likely not from raw ingredients. Instead, ingots were obtained from the south via the river trade on the Rhone and the Rhine. 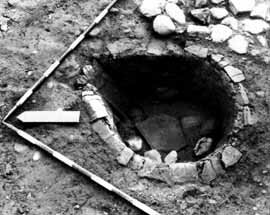 Such a furnace was recently unearthed in the eastern corner of a Roman apartment complex at Octodurus (modern Martigny), on the Rhone in Switzerland. Its modest size—roughly three feet square—and the fact that it was roughly framed out just as a pit in the ground, underscores how temporary such structures tended to be. They easily could be churned into the foundations of a subsequent building phase and so lost to us for ever.